People communicate by different means, Jennifer noted. When projects move online it can create problems when managing not just tasks, but people as well.There are, however, huge benefits to managing projects online. Jennifer. One is that the software you’re using upgrades automatically, so that’s one less thing you need to plan for. Version control is minimized as well. That being all the time that can be wasted when people are working on a document that is old instead of the updated one.Being online naturally facilitates collaboration. Online tools can also offer dashboard views of the project’s progress that can not only be shared among team members but seen in real-time for a more accurate view of where the project is progress and where it’s blocked.There’s customization, which allows you to direct the information about the project to the resources that need that information. It means that your team members won’t get inundated with unnecessary data. For you as team leader, the collaborative nature of being online and the ability to see where each team member is in terms of fulfilling their tasks, gives you a better understanding of your team and how to manage them.Once you’ve decided on what software is a good fit for you, read this article on Project Management Software Tricks to get more bang for your buck. Pro-Tip: There are lots of online project management tools out there, and each one is not necessarily a good fit for you or your organization. It’s best to “kick the tires,” which is why it’s recommended to find those softwares that offer a free trial and see if the features work for you.Thanks for watching! 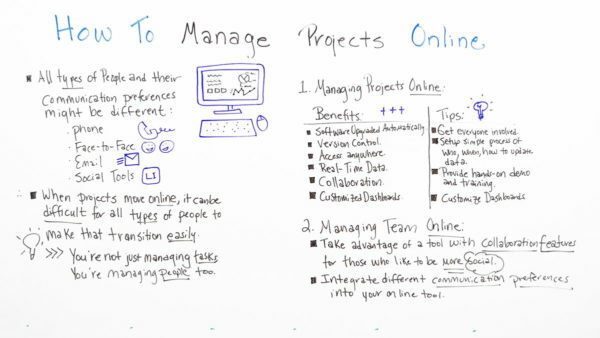 Well, today we’re talking about how to manage projects online. Well, one thing to remember is that on projects, there’re all types of people on our projects. And they have different communication preferences that may be different. For instance, some people like to communicate by phone. Others may prefer face-to-face. There’s still some people who prefer email and there are some people who just love social tools. Well, when projects move online, it can make it difficult for all people to make the transition because of that. And remember, we’re not just managing tasks, we’re managing people too. So when managing projects online, there’s some huge benefits and some tips we want to share. The benefits are that the software’s upgraded automatically. So you don’t have to plan, you don’t have to schedule all of the desktop implementations for the people in your team.It also minimizes problems with version control. You know, you spend time on that document to find out that everyone’s been editing an outdated version. You can also access the data and the software tool from anywhere. You can also access real-time data because people in your project can get online at any time. And you can also collaborate with different people on your team who may not otherwise participate. Also it allows you to customize your dashboard so the people on your team can get the data and information that they need without seeing and getting overwhelmed by so much other data that’s not important to them. So some tips for managing your projects online is get everyone involved, get them excited and get them believing in the benefits of moving online. Also set up a simple process for who, when and how to update the data, so that you can get real-time data and that it’s accurate and relevant. You also want to provide a hands-on demo or training so people can see, “Where are the screens? Where are my files? How do I update?” And also customize their dashboards. Again, so they are looking at information that they want to see, that provides the insights that they need for decision making and getting their work done. In managing the team online, a big thing to remember is to take advantage of a tool with collaboration features for those who like to be more social. Again, that way, you get more ideas, you get a better understanding of what’s really happening on your team. And also integrate different types of communication preferences into the online tool so they’re more apt to get involved. So if you need a tool that can help you manage your projects online, then sign up for our software now at projectmanager.com.